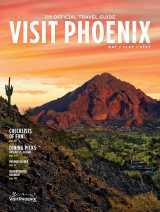 With those six words, Tarbell captures the essence of the Greater Phoenix Convention & Visitors Bureau’s latest marketing project: a series of videos that allows local celebrities to share their ideas of a “dream day” spent in America’s sunniest metropolis. The goal of the Dream Day videos is authenticity, said Greater Phoenix CVB Marketing Director Melissa Gogel. And Tarbell, an Iron Chef winner, provides loads of it in the series’ inaugural episode. In the scene described above, Tarbell isn’t even dining in his own restaurant, but rather his favorite neighborhood breakfast joint. Earlier in the video he is seen scampering down red rocks at his favorite hiking spot, and later he visits a small bakery for homemade cupcakes and an outdoor patio where his friend from the band Gin Blossoms is playing live music. The Greater Phoenix CVB has produced three Dream Day videos so far. The others feature fashion designer Angela Johnson and Latina artist Kathy Cano-Murillo. Johnson got the attention of the national fashion scene by creating dresses and ballgowns out of recycled T-shirts, while Cano-Murillo is an author and syndicated newspaper columnist who is better known to her fans as the Crafty Chica. On tap for future Dream Day videos are Phoenix Mayor Phil Gordon and the nightlife columnist for The Arizona Republic. The camera follows Johnson — her jet-black hair styled in a bob and an artful tattoo adorning her arm — to several funky locales in downtown Phoenix, including local fashion boutiques and an Asian-fusion eatery with DJ-spun background music. She also takes viewers to the fashion gallery at Phoenix Art Museum and shows off her favorite stops at downtown Phoenix’s First Friday Art Walk. The bubbly Cano-Murillo starts her Dream Day with breakfast at a working farm, where tables are arranged on a green swath of grass lined with citrus trees. Later she stops at a cherished lunch spot that specializes in Native American fry bread and happily subjects herself to “sensory overload” at a bustling Mexican grocery store and market. “The personalities and backgrounds of the first three Dream Day hosts are very different, but one thing we discovered they had in common was a fondness for independently owned businesses,” said Greater Phoenix CVB Online Marketing Manager Kelley Cooper. Cooper said the Dream Day videos were conceived as resources for travelers who research their trips online, but they also have generated positive feedback from locals who were unfamiliar with some of Phoenix’s hidden gems. The Dream Day videos can be found on YouTube (www.youtube.com/greaterphoenixcvb). They have received more than 4,000 visits since the launch of the first episode in April. Cooper said the Dream Day videos fit nicely into the CVB’s larger social-media plan, the goal of which is to expose potential visitors to Phoenix through the insights of locals. Those insights are shared via a “Visit Phoenix” Facebook page and Twitter profile, as well as a blog called The Hot Sheet that focuses on independently owned restaurants and retailers. The Facebook fan page has been particularly successful, Cooper said, thanks to weekly resort-package giveaways that Visit Phoenix fans can win by being the first to correctly answer a trivia question. The weekly giveaways have included multiple-night stays, spa treatments, rounds of golf and tickets to professional sporting events.